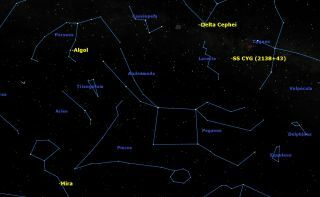 Four of the most famous variable stars are visible currently around 9 p.m. in the evening: Mira, Algol, Delta Cephei, and SS Cygni. Late autumn is an excellent time to observe four of the most variable stars in the sky: Mira, Algol, and Delta Cephei. While most stars shine with a steady light for most of their lifetimes, some stars show a changing brightness over time. These are some of the most intriguing objects in the sky, and have contributed to our knowledge of the heavens. Some stars' variability is regular as clockwork, caused by physical motion or rapid pulsation of the star’s diameter; others are slow and irregular. Some are totally unpredictable. These stars are exciting to observe because you can never be sure ahead of time exactly what you will see, and sometimes you can actually see the star change brightness before your very eyes in real time. Scientists use a magnitude scale for star brightness. On that scale, the lower an object's magnitude number the brighter it is, with negative number magnitudes denoting exceptionally brilliant objects. Mira, in the large dim constellation of Cetus the Whale, was one of the first variable stars to be discovered. David Fabricius in 1596 was the first to notice that this star changed in brightness over time. Careful observations showed that this star varied in brightness from second magnitude, one of the brightest stars in this part of the sky, to naked-eye invisibility at 10th magnitude. Mira, in the constellation Cetus, is the classic long period variable star, slowly pulsing and changing color over a period of nearly a year. Currently Mira is around 8th magnitude, so you will need binoculars to see it. It is separated by only 2 arc minutes from a 9th magnitude star, but is most noticeable because, like most long-period variable stars, it has a deep red color. That is because these long period variables are all red giant stars, pulsating slowly in the late stages of their development. Mira has a period of 332 days, almost a year in length. Besides changing brightness by 8 magnitudes, it also varies in color, appearing reddest when it is at its dimmest. Its distance is poorly known, but appears to be around 300 light years. Our second star, Algol, has been known to be unusual since ancient times. Its name means "The Ghoul" in Arabic and it has sometimes been called the "demon star." In early illustrations, it is often depicted as the Gorgon's head in Perseus' hand. Algol, the second brightest star in Perseus, is an eclipsing variable: two stars orbiting each other and cutting off each other’s light. Algol is what is called an "eclipsing variable." It consists of two stars orbiting each other at a close distance, less than 6 million miles (9 million kilometers). As they orbit, each star cuts off the light from the other for a short period. The result is that Algol’s brightness varies by 1.2 magnitudes every 2.86736 days, or 68 hours 48 minutes 59.9 seconds. Yes, its period really is known that precisely. Algol is the second brightest star in Perseus. It varies between magnitude 2.1 and magnitude 3.3, so is easily observable. You can estimate its brightness on any particular night by comparing it to nearby stars Mirfak (magnitude 1.8), Atik (magnitude 2.8), and Menkib (magnitude 4.0). Delta Cephei gives its name to the Cepheid class of short period variable stars, used as a cosmic yardstick for measuring astronomical distances. Delta is part of a small isosceles triangle of stars at one of the bottom corners of the “house” shape of Cepheus. The other two stars in the triangle, Zeta and Epsilon, are magnitudes 3.4 and 4.2 respectively, making them good stars to compare Delta’s brightness to, as it varies between magnitudes 3.5 and 4.4. Simply rank the three stars from brightest to faintest, and you will find out exactly how bright Delta is on a given night. The last variable is much fainter than these, but one of the most unusual stars in the sky. Located in a small triangle of stars close to Deneb and the North America Nebula in Cygnus, SS Cygni is what is called a cataclysmic variable or a dwarf nova. SS Cygni is a “dwarf nova” in Cygnus, exploding violently and unpredictably every couple of months. Just as a dwarf planet is not a planet, a dwarf nova is not a nova. It is like a nova in that it undergoes a significant brightening (about 5 magnitudes or 100 times brightness), but it does so at frequent and irregular intervals, roughly every seven to eight weeks. Most of the time it sits down around 12th magnitude, but for a day or two every two months, it pops up to 8th magnitude. If you’re really lucky, you can catch it on the rise, and actually observe it brighten in real time. SS Cygni is part of a close binary star system. One star is a cool red dwarf; the other is a small dense white dwarf. The two stars are less than 100,000 miles apart, orbiting each other in 6.5 hours. Because they are so close, material passes from one star to the other and periodically ignites, causing the flare-up in brightness. I find SS Cygni one of the most exciting objects in the sky to observe because I never know in advance whether it will be a dim 12th magnitude star or blazing forth at 8th magnitude. That’s what makes observing variable stars so absorbing. For more information on variable stars and detailed charts, visit the website of the American Association of Variable Star Observers.